Finally figured out how to add a "Books" tab to my Facebook page so that people can buy my books directly from Amazon, without having to go through my website The links also show editorial and customer reviews. Sweet deal! Novum: Rubicon now has a cover - and it's brilliant! Late last night, my brother, Dave (daverhea.net), sent me the newest version of the book jacket he's been designing for "Novum: Rubicon" - the next installment in my scifi series. I have to tell you that it blew me away! We've been working on it for a couple of weeks now (that is to say, I give him suggestions, and he makes something, and sends it to me for feedback,) and we were both getting frustrated because nothing was working. I had this idea of what I needed the book to convey, while at the same time, have it fit with the theme of the first two book covers, which was really difficult. Well, he came up with the final solution on his own and it's brilliant. I'm really looking forward to showing you all the cover - all I need to do now is finish writing the darn thing. This is for all ebooks from all distributors (Amazon, Apple, Sony, etc) all over the world. I'm taking advantage of a rare two hour writing window tonight to officially start the 3rd book in my scifi series, Novum. It will be called Novum: Rubicon and it involves a long and dangerous journey into the unknown for the crew of the Rogue Wave. I'm actually hoping to make this the beginning of my own version of #NaNoWriMo ( National Novel Writing Month ) where I will attempt to complete this 30k word novella in one month. That's about three times faster than my normal so it's probably not doable with my schedule, but I will make a valiant effort. Wish me luck. The 2nd book in my Novum series now has a title - and a brand new cover! Well, the beta-reads and edits are nearly finished (thanks again to all who helped) and now I'm waiting for a brand new cover design from my brother, Dave. Can't wait to see it. Novum-2 first draft is finished. I'll probably add another 3,000 words during my rewrites, but then a few hundred will be cut during the lengthy editing process. That's how it works...at least for me. Also, Novum received its 25th review yesterday. Another nice one. Thanks to all who have taking the time to write a review on Amazon or goodreads. You people rock! Last week I ran a 5-day giveaway of my scifi story, "Novum" on Amazon, and during that short window, more than 5,000 copies were downloaded. You might ask why I, or any other author, would give away so many free copies of their book. For me, the answer is simple: publicity. Novum is the first book in a series, and I felt giving away copies would help get the word out. A good book, or even a halfway decent book, means very little if no one knows it exists. Also, while 5,000 copies seems like a lot of books to just give away, it is actually a tiny drop in a very large bucket in terms of potential readers. Now I have to say the biggest surprise to me, and the real "payback" for this effort, is that Novum has received 12 new reviews in the past 11 days, which is more than double what it had before (5 of those reviews came within the last 24 hours, including one as I was writing this!) Even including the few "expected" negative reviews centered on the fact that Novum is short (it is a 26,000-word novella, compared to my first book, Cyberdrome, which is a full 96,000-word novel) the reviews have all been overwhelmingly positive. 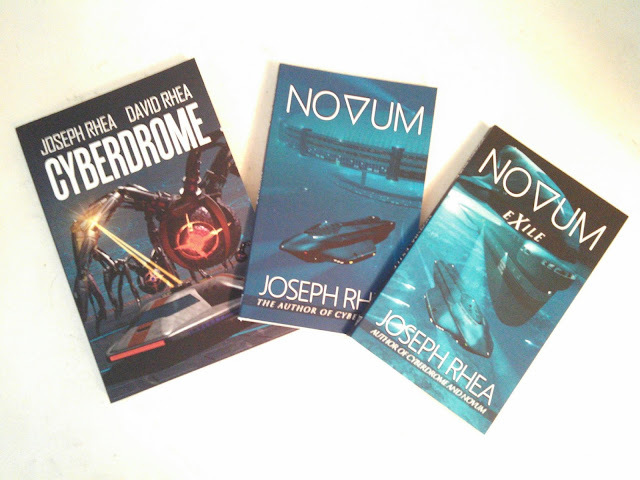 During March, I also ran a promotion on Goodreads.com to give away 10 paperback copies of Novum. That promotion generated over 700 people who wanted a copy, so I have to include that number as additional potential future readers. Novum on sale for just 99 cents! After a hugely successful week-long promotion, I've dropped the $2.99 #Kindle edition of Novum down to $0.99 for another week or so. There's nothing like having a party and forgetting to send out the invitations. So apparently CYBERDROME is on sale for just 99 cents in the US and UK (down from $5.99) and NOVUM is absolutely #free all over the darn planet (usually $2.99) Please considering passing the word around since I forgot to. If you have either of these books 'liked' in your fb page, please update your links to these pages.